New to decorative planning and looking for the best way to get a great supplemental kit for a great price? 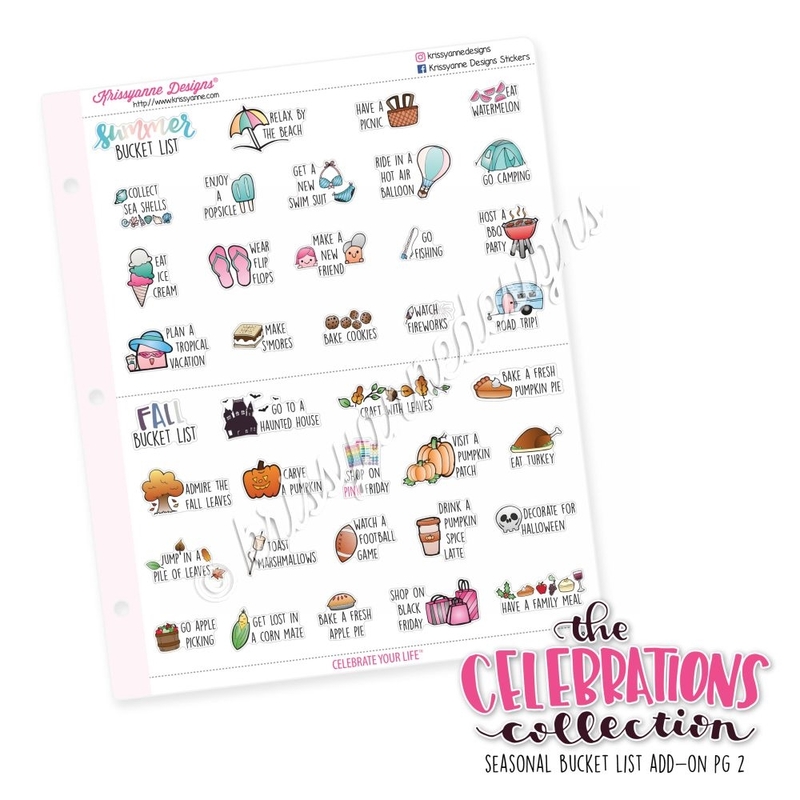 Whether you're new to planning or already have a collection, this two-page Seasonal Bucket List Add-On set is the perfect addition to your 2017-2018 Celebrations Collection. 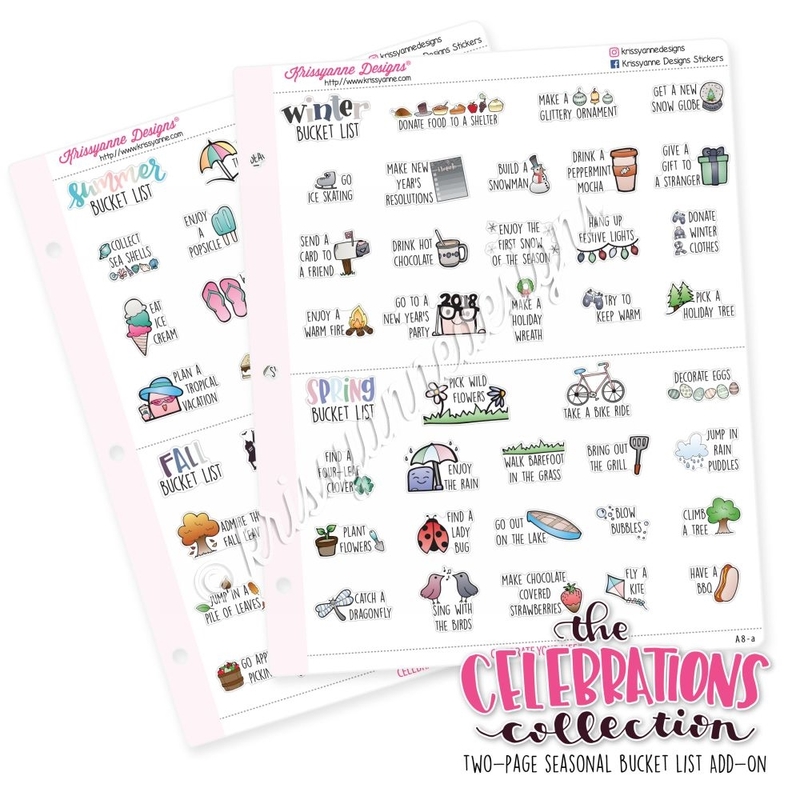 This binder sheet was designed to supplement our 2017-2018 Celebrations Collection and includes a variety of hand-drawn, colored and curated stickers designed exclusively for our collection. These hand-drawn and altered designs are combined with many signature Krissyanne Designs functional and decorative stickers you have come to know and love to create a beautiful addition to your planning that you won't find anywhere else! Stickers on this sheet are not designed to fit in any specific planner. They are designed to fit not only in planners, but can also be used in scrapbooks, on cards, and anywhere else your imagination allows. Stickers in this collection are sized to remain consistent with the size and shapes of Krissyanne Designs stickers that you have become accustomed to using. Don't be afraid to modify your stickers to make them fit your specific needs; that's part of the fun in planning! Please remember that colors may vary from monitor to monitor. For more information regarding binder size or what's included, please see supplemental images, video, and Technical Information. 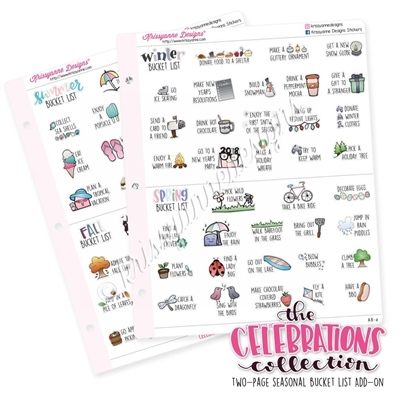 The Celebrations Collection was a collaboration project with over 700 pieces of artwork that have been hand-drawn exclusively for Krissyanne Designs by Cindy Guentert-Baldo of Llamas Love Lettering. Each piece of artwork has been digitally colorized, altered and curated by Krissyanne Designs to create a truly unique set of images perfect for celebrating your life. For more information on the entire collection, please visit our FAQ here. All Signature Krissyanne Designs Binder sheets are printed the same size to allow for uniformity in storage. Sticker sheets are approximately 8" tall and are wide enough to fit beautiful in our Signature KAD Binders, which measure approximately 9" wide by 7" tall and can hold a maximum of 42 sticker sheets. All stickers are cut on the sheet to allow for effective removal from the backing and each sheet is punched to fit perfectly in your binder. Due to the type of sticker paper used, stickers may seem slightly more difficult to remove from the sheet than you may be used to. Do not be afraid to bend the sheet to remove the stickers. Note: No stickers printed by Krissyanne Designs are weatherproof, but ink should not bleed if they come in contact with slight moisture. It is not recommended to leave your stickers in a hot or humid area for an extended period of time as this could affect the adhesive.